Even if you cannot swim- you can still do Aquanautas under water helmet diving! Dive into the Ocean of Bayahibe and walk on the sea floor to explore all its wonders, with no training, just by wearing one of Aqua Nautas special helmets. Imagine walking in zero gravity while surrounded by incredible aquatic life - that's Aquanautas - your under water helmet diving experience! 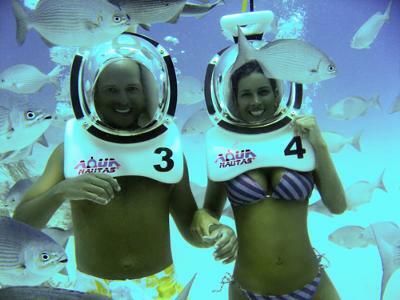 Aquanautas under water diving helmets are designed primarily for tourism-related activities such as resorts, aquariums and water parks. Designed by a Canadian engineering firm, Aqua Nautas assures quality and durable diving helmets to its clients around the world. Aqua Nautas under water helmet diving is very unique, fun and safe water sport activity for ages of 10+. Requires no swimming knowledge and equipments such as scuba tanks, regulators, mask and weights. This great activity is available in Bayahibe / Dominicus. Cost is only $45 for 25 minutes of unforgettable experience. For more information about how to book use our online contact form being sure to use the subject line: Aquanautus -- and we will send you info by return. Wow! I like water funny games. And your ideas is very interesting for me. Thanks for sharing it with us. This photo is so cool. I envy this lucky ones. Please keep it good posting. And don't forget use particular writing help from www.custom-paper-writing.org at any suitable time! swimming lessons Watford - We’re home to some of Hertfordshire and Buckinghamshire’s best equipped, most friendly and affordable health, leisure, sports and arts facilities. Our Centres are located in Milton Keynes, Rickmansworth, South Oxhey, Bushey, Potters Bar and Borehamwood. Swimming lessons hertfordshire - We’re home to some of Hertfordshire and Buckinghamshire’s best equipped, most friendly and affordable health, leisure, sports and arts facilities. Our Centres are located in Milton Keynes, Rickmansworth, South Oxhey, Bushey, Potters Bar and Borehamwood. Its good to see the facilities provided in this island to do sea walk. I always dreamed of that and now I'm getting it happen real. I will soon write my essay services to know what tips we should take before entering the sea waters.